Season start and 8th dan in the region, everything’s perfect to start again ! Training starts this week with 2 days for veterans on Tuesday 4th and Friday 7th. Come earlier for registrations. From next week on, we hope to see lots of new faces for the start of the beginner courses ! 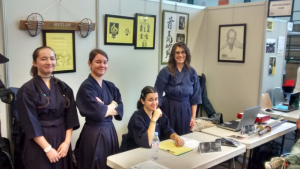 From 28 to 30 September, we invite you to practice Kendo in Milano, Italy ! Schedule and registrations are here. You can come on the days you want. Registration is open until 21 September but the soonest, the best ! What an exciting season start with two regional meetings and the 1st one is this Thursday 6 September ! Chambéry welcomes us for a ji-geiko evening with Ohta sensei (8th dan from Kokushikan University). He will then be in Bourg-en-Bresse for the sixth edition of the kata/ji-geiko training on 8 and 9 September. Regional schedule is now available, don’t hesitate to give it a look ! Club and society fair will take place on 8 September at gymnase du Charlais from 8h30 to 14h30. You can now find our brand new rules and regulations ! You can now fill the bill of expenses online ! Pay attention, you still need to give the vouchers, without them, no Club participation to your expenses. You can find the paper or online version on the forum (in French) or on the https://www.meylankendo.fr/documents-liens/website (in French) !